Deputy Secretary-General Jan Eliasson addresses the Security Council meeting on the 1994 genocide in Rwanda. Unanimously adopting a new resolution during a special meeting devoted to commemorating what UN Deputy Secretary-General Jan Eliasson referred to as “one of the darkest chapters in human history,” the Council underscored the importance of taking into account the lessons learned from those tragic 100 days in 1994, when genocide was committed against the Tutsi in Rwanda, during which Hutu and others who opposed the genocide were also killed. “As we mark the passage of 20 years since the genocide, we also pay special tribute to the impressive work of the Rwandan people for their own recovery and reconciliation,” said Mr. Eliasson in opening remarks, emphasizing that in the years since the tragedy, “Rwanda has come a long way” and is one of the few countries that have established a national institution dedicated to the prevention of genocide. Yet, from Syria to South Sudan to the Central African Republic – and beyond, today’s conflicts sadly show that efforts to protect populations from atrocities remain elusive. “These and other crises have different roots, yet there is a commonality. Across the landscape of conflict, we see similar fault lines – divisions based on religion, ethnicity, even language,” he said. “And we see the rise of separatism, of extreme nationalism and demonization of ‘the Others;’ ‘Us versus Them;’ and ‘Our way or no way,’” Mr. Eliasson warned, stressing that no country is immune from the threat and all of humanity is diminished by it. All societies must therefore assess their vulnerability and work at every level to build resilience, tolerance and vigilance in detecting early warning signals of this nature of crises to come. 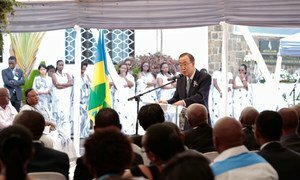 “My first responsibility today is to remember the victims, the almost 1 million who died, and the survivors…this briefing also provides a fitting opportunity, for me in my capacity as former President of the Council, to apologize for what we failed to do in 1994 and for that to be formally recorded in the official records of the Security Council,” he said. Further, another vital piece of evidence also existed in the UN system in Geneva – a report by a Special Rapporteur to the then-Human Rights Commission warning of the likelihood of genocide. “It was never drawn to the Council’s attention,” said Mr. Keating. In early May 1994, New Zealand and Nigeria each introduced draft resolutions to boost the number of troops and give the UN operation a formal civilian protection mandate. But it took until 8 June before a new resolution was agreed. “For the first time, the Council specifically used the word ‘genocide’,” he said. While noting that important lessons had been learned from the genocide and some Council procedures had been adjusted in its wake, he urged all present to be keenly aware of “the cascade of tragedy that can occur when there is a failure of political will such as in 1994.” Indeed, a toxic accumulation of events unfolded and eventually embroiled the whole Great Lakes region, he said. “If we truly want prevention to work, then we need better political and operational and financial mechanisms for the Council and the wider UN system to achieve better outcomes,” declared Mr. Keating, appealing for new mechanisms for improved early warning, better systems for briefing and presenting options to the Council at early stages of potential crises, enhanced preventive diplomacy, quick preventive deployment, and, if all else fails, robust deterrence. “I suggest that the costs of investing in such mechanisms would be insignificant when set alongside the dreadful human, political and financial costs of inaction that flowed from our collective failure in 1994 to respond to the genocide in Rwanda,” he said in closing. Commemorating “one of the darkest chapters in human history,” United Nations officials paid tribute this morning to the 800,000 men, women and children – overwhelmingly Tutsi, moderate Hutu and Twa – that were systematically killed 20 years ago in Rwanda, and urged the international community to work together and remain vigilant to prevent such atrocities from ever happening again.